One of the absolute pleasures of working as a quality control technician in the Preservation and Digital Conversion Division’s Digital Imaging Lab is seeing the wide variety of fascinating materials that pass through the studio on a regular basis. Recently, the Imaging Lab was asked to digitize photographs from the Frederick Fried Coney Island Collection held in the Rare Book and Manuscript Library (RBML). The photographs in this collection depict many aspects of the famed resort, including “bathing beauties,” “freak shows,” parades, and renderings of the crowds and attractions. 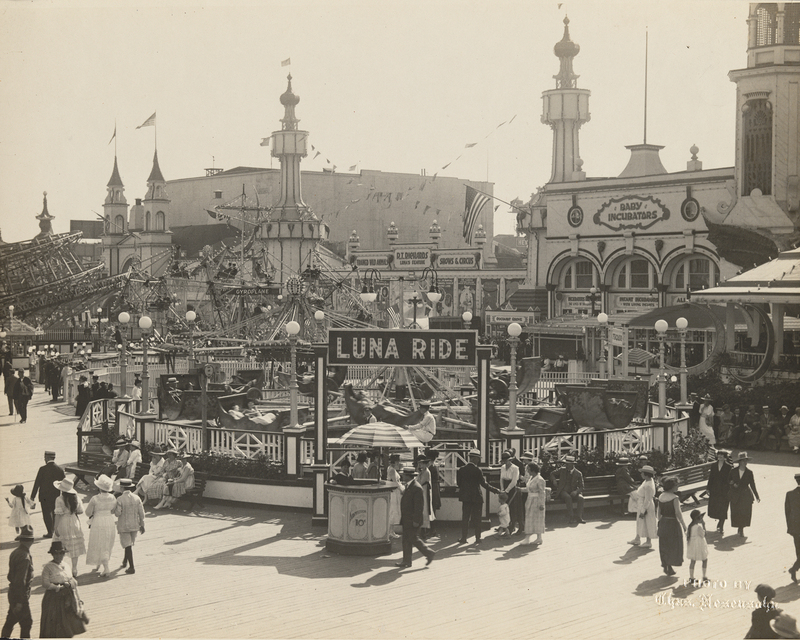 One of the photographs caught my eye: it depicts a scene at Coney Island featuring the famed Luna Ride. However, just behind the ride you can see a sign for “Baby Incubators,” a building I was previously unaware of. I associate incubators with hospitals–why were they at an amusement park and who were these babies? This deserved some more attention and research, so I dug into the history of the Baby Incubators. I learned from Thai Jones, RBML’s Lehman Curator for American History, that this was an attraction created by Dr. Martin Couney, where premature babies received treatment under the public eye. Dr. Couney created the exhibit in order to prove the benefits of his new technology. The exhibition lasted from 1903 until 1943 and saved the lives of more than 6,000 premature babies. Further information on Baby Incubators can be found in the new book, The Strange Case of Dr. Couney: How A Mysterious European Showman Saved Thousands Of American Babies, by Dawn Raffel. This entry was posted in Digitization, Photography on October 9, 2018 by Nancy Wolfe.